These are the same parts used and trusted by Acura/ Honda, Dealerships and Technicians world-wide. Perfect Fit, Quality, Durability and Low Noise! This kit meets or exceeds original equipment specifications. (2005 2006 2007 2010 2011 2012). (2004 2005 2006 2007 2008). All Models with 6 Cylinder / 3.2 or 3.5 Liter / V6. (2003 2004 2005 2006 2007 2008 2009 2010 2011 2012). All Models with 6 Cylinder / 3.0 and 3.5 Liter / V6. (2005 2006 2007 2008 2009 2010 2011 2012 2013 2014). (2006 2007 2008 2009 2010 2011 2012 2013 1014). Includes The Following Brand New Parts. A/C, P/S, Alternator - ALL. We recommend testing your current hydraulic tensioner. 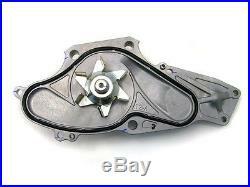 These tensioners are expensive and rarely go bad, even after 250,000 miles. Unless your hydraulic tensioner is visibly leaking, save yourself a few bucks! 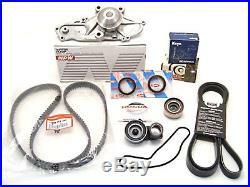 The item "New Honda Acura 3.0L 3.2L 3.5L V6 Premium Timing Belt Water Pump Kit" is in sale since Wednesday, March 27, 2013.